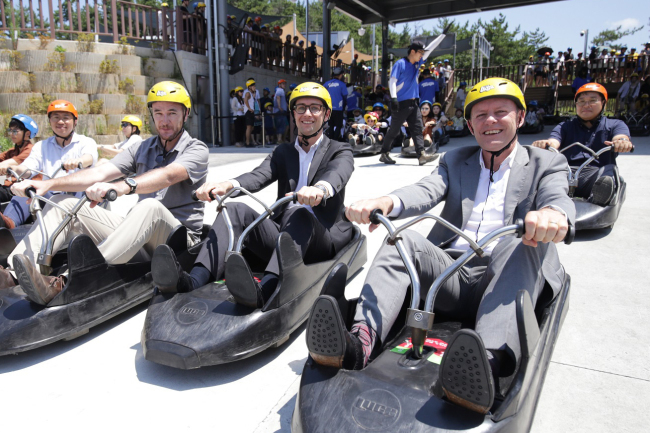 New Zealand Ambassador to Korea Philip Turner on Friday visited Skyline Luge Tongyeong, an entertainment facility in South Gyeongsang Province owned by a New Zealand company, on his first official tour to the region. The Skyline Luge Tongyeong development is the biggest investment in Korea to date by Skyline Enterprises, a Kiwi company with a diversified portfolio and operating predominantly in leisure and entertainment fields in New Zealand and overseas. The firm plans to invest a further 10 billion won ($8.9 million) over the next two years that will go into constructing four new luge tracks. “It was great excitement to visit Skyline Luge Tongyeong. I was so impressed by their strong commitment to grow as a member of the Tongyeong community, making New Zealand’s biggest investment in Korea and creating lots of local jobs,” remarked the envoy on Friday. Turner added that he believed the venue was “a safe and exciting adventure attraction not only for adults like me, but also for family visitors,” lauding its hospitable and professional services. Skyline Luge offers riders full control of their descent on tracks laden with twists, turns and tunnels. The luge is an outdoor entertainment system suitable for everyone, and was invented in New Zealand in 1985. Since opening in February last year, 2.7 million rides at the facility have been recorded, far exceeding the company’s expectations, according to Skyline Enterprises. “Skyline is committed to continuing our investment in Tongyeong, and we are grateful for the support of the local community. We currently employ more than 75 full-time local staff and the number will grow as our development continues,” said Skyline Luge Tongyeong General Manager James Dudfield. Turner presented his ambassadorial credential to Korean President Moon Jae-in on July 25. Prior to his ambassadorship here, he was a senior executive at the Auckland-based multinational dairy cooperative Fonterra. Before joining the cooperative, he was a diplomat at the New Zealand Ministry of Foreign Affairs and Trade and was posted to embassies in Tokyo and Brussels.